Tag Archives for " Speeding "
I was going with the flow of traffic, is that a valid defense? Going with the flow of traffic is not a defense. Here in Maryland, especially along the interstates (I-70, I-95, I-695, I-195, I-795, etc. ), 'the flow of traffic' is generally above the posted speed limit. The way the speeding law is written (Transportation Article §21-801.1), as long as you are traveling above the posted speed limit, regardless of reason, you are technically guilty of speeding. Even though many police officers don't issue citations for just a couple miles an hour over the limit, they are allowed to do so. A police officer can only stop one vehicle at a time (unless the officer is working as part of a speed enforcement team, then they can collectively stop more than one vehicle at a time), so as many judges say "you were the unlucky one that day." If you received a speeding ticket in Maryland, and would like to discuss your case with Scott, complete the Traffic Ticket Evaluation Form. There were other cars on the road around me, how does the police officer know it was me? The answer to your question varies slightly depending on what technology the officer used to obtain your speed. In Maryland, almost all stops for speed are based on either LIDAR or RADAR (although your speed can be determined by pace, VASCAR, or other means). How the unit works and how the officer determines that the speed reading is from your vehicle differs slightly between the two. LIDAR units use pulses of light to determine the speed of a vehicle. When the officer lines up the sight on the LIDAR unit with the front of the car, he/she pulls the trigger and three pulses of light (laser beams) are shot at the target, reflect off of the target, and are then 'received' by the LIDAR unit. The unit then uses distance the laser beams traveled, along with how long it took them to travel the distance to determine the speed of the target vehicle. LIDAR units are typically certified to be accurate to +/- 1 MPH and are claimed to be vehicle-specific to up to 4,000 feet or 3/4 of a mile, although most readings I see are under 2,000 feet. LIDAR units are deemed to be vehicle-specific because the 'angle of influence' (how wide the beam is) of the laser beam is so narrow that even at a distance of 4,000 feet, the beam should not be wider than one car. RADAR units use pulses of radio waves to determine the speed of a vehicle. Unlike LIDAR units, most RADAR units are always on, sending and receiving signals (although there are some instant-on radar units). RADAR units also have a much wider 'angle of influence', so the officer must take additional steps to make sure that the reading the unit is displaying is accurate and for the proper vehicle. As part of the 'proper operating procedures', the officer is supposed to visually estimate the speed of the target vehicle. The reading on the RADAR unit should correlate with that visual estimate. Pacing is when the officer essentially follows a vehicle and uses the police cruiser's speedometer to get a speed. In theory, when a police officer paces a vehicle, the officer's cruiser and the target vehicle are traveling at identical speed, with the target vehicle immediately in front. VASCAR is used in a manner similar to a pace, but the police cruiser does not need to be traveling at the same speed as the target vehicle. In fact, the police cruiser can be stationary. VASCAR works based on the mathematical formula of distance divided by time equals speed (e.g. 65 miles divided by 1 hour = 65 MPH). When stationary, the officer measures a distance between two objects (for example two telephone poles) and enters that into the VASCAR unit. When a vehicle passes the 1st known object, the officer clicks a button starting the timer on the VASCAR unit. When the vehicle passes the 2nd known object, the officer clicks the button again, stopping the timer. The VASCAR unit then calculates the average speed of the vehicle between the two objects. 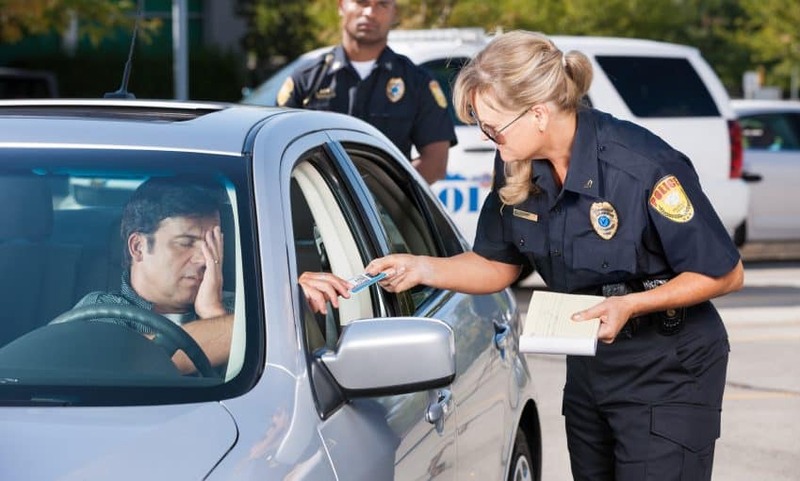 Regardless of the method the officer used to obtain your speed, an experienced traffic defense lawyer knows how to exploit every possible weakness in the State’s case. 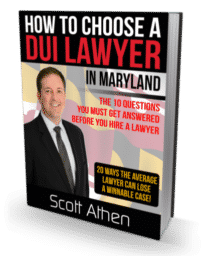 If you received a speeding ticket in Maryland, and would like to discuss your case with Scott, complete the Traffic Ticket Evaluation Form. 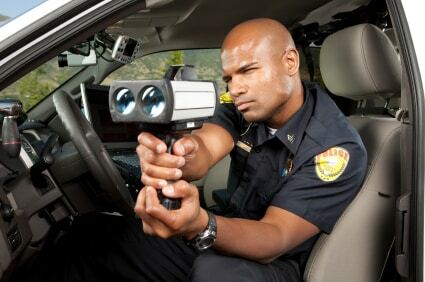 Does a police officer have to show me his RADAR gun? It is a common misconception that an officer has to show you his RADAR or LIDAR (Laser) device. In Maryland they can't even lock the speed in. At trial it comes down to the officer's word against your word. The officer was presumably using equipment that has been calibrated and certified. Most stops in Maryland are based on LIDAR, or laser, although many police cruisers have RADAR units installed. Some of these RADAR units are "moving" RADAR units, which means the unit can obtain speed readings of other vehicles while the cruiser is moving. LIDAR units are deemed to be vehicle-specific, because the laser beam is so narrow. The LIDAR unit has a red dot in a sight, and the officer places the red dot on the front of your vehicle (typically aiming for the license plate, or grill) and pulling the trigger. The LIDAR unit then sends out three pulses of light that bounce off the front of your car, and are reflected back to the LIDAR unit. The unit then uses the distance that those three beams of light traveled, along with the difference in time between the light pulses to calculate the vehicle speed. The speed shown on the LIDAR unit is supposed to be accurate to within 1 MPH, and it also gives the officer the distance between your car and the officer to the 1/10th of a foot. RADAR units have a much wider beam, so it 'gathers' more information. The unit displays the speed of the strongest signal, not necessarily the fastest object. Among other operating procedures, the officer is supposed to use the "Doppler Tone" to determine the strength of the signal. The louder, and higher the pitch of the Doppler Tone, the stronger the signal. ​Moving RADAR uses the same technology as Stationary RADAR, but the unit has two RADAR antennas, operating at different frequencies. Because the unit uses two different antennas, there are more checks that must be done to make sure the unit is operating properly, and when used in moving mode, the officer is supposed to make sure that the speed at which the RADAR unit thinks the cruiser is driving matches the speed on a certified and calibrated cruiser speedometer. ​There is a way to fight speeding tickets, and an experienced attorney knows how to exploit every possible weakness in the State's case. 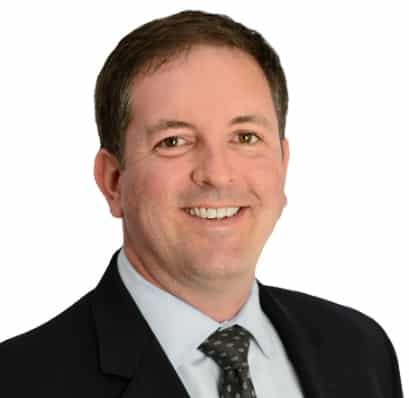 If you received a speeding ticket in Maryland, and would like to discuss your case with Scott, complete the Speeding Ticket Evaluation Form, and Scott will contact you. What should I do when I get a ticket? If the officer told you why he stopped you, now is not the time to argue. It is imperative that you are polite and cooperative with the police officer - your cooperation or lack there of will be brought up in court. 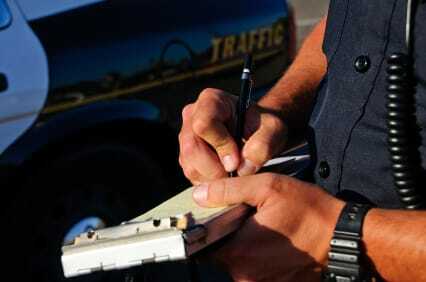 If the officer gives you one of the hand written tickets, be sure to sign the ticket. Just signing the ticket is not an admission of guilt, it is just acknowledgment that you received the ticket. If you don't sign the ticket, the officer can arrest you! For more information about your choices, read this post. * 30 days to comply if you receive what is called a "minor traffic ticket" (jail is not a potential penalty). If you are charged with "serious traffic" offense(s), you must appear for trial, and a trial date is automatically set. If you would like Scott to take a look at your case, complete the Traffic Ticket Evaluation Form. Did you like this post? If so, please share and leave a comment below! How should I comply with the ticket – Pay the Fine, Request a Waiver Hearing, or Request a Trial?